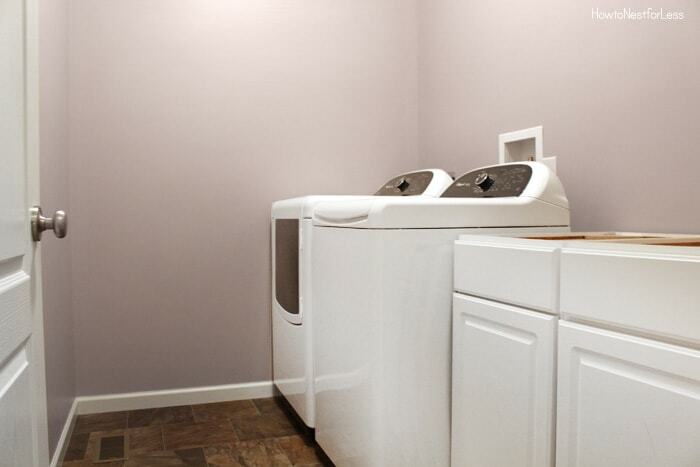 I have to admit that the photos for this laundry room aren’t the best. They were taken with my iPhone since my camera is packed away for the big move. Luckily I snapped a couple quick pics before we starting tearing everything off the walls and throwing it into boxes! This really was an inexpensive makeover that I threw together over a weekend. 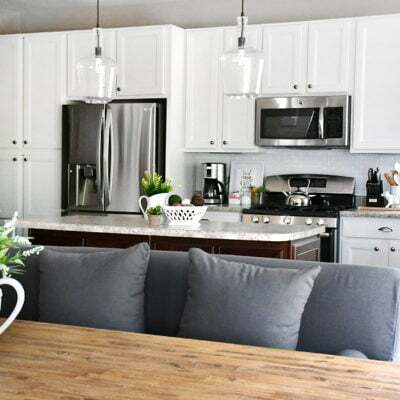 The biggest addition to the space was the cabinets & countertop. 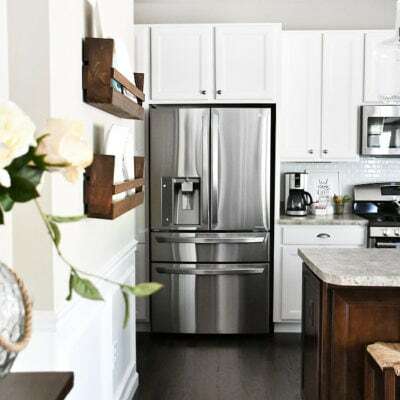 They are just white stock cabinets and a stock countertop that we cut down ourselves to fit the space. My absolute favorite part of the room is the vintage-style prints I found on Amazon. 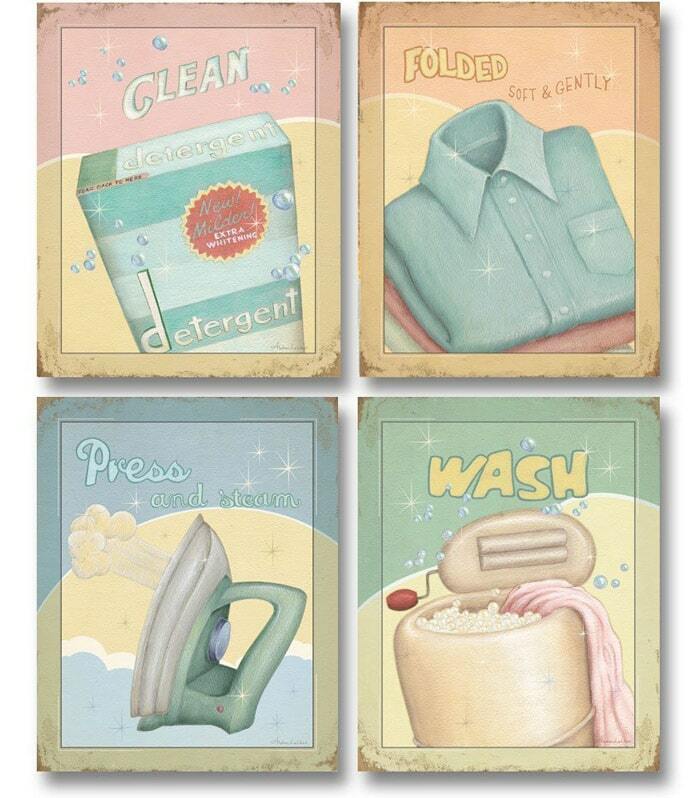 Only $7.50 for ALL 4 prints! I just found some cheap white frames from Michael’s. Seriously LOVE these. 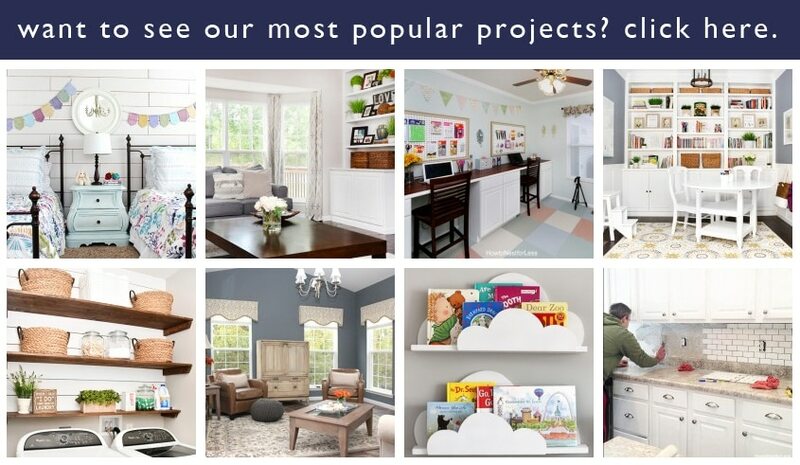 At first I was thinking about wall cabinets above the washer & dryer, but I was trying to stick to a budget. 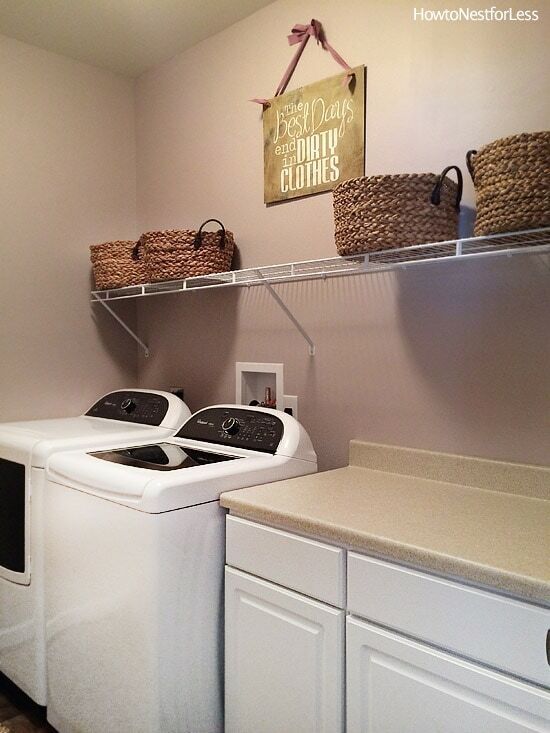 So instead I just hung a long wire shelf and reused the baskets from our old laundry room. You might recognize that old sign too! Yep, I reused a lot of ideas & supplies from our old space. Just gave it new life! 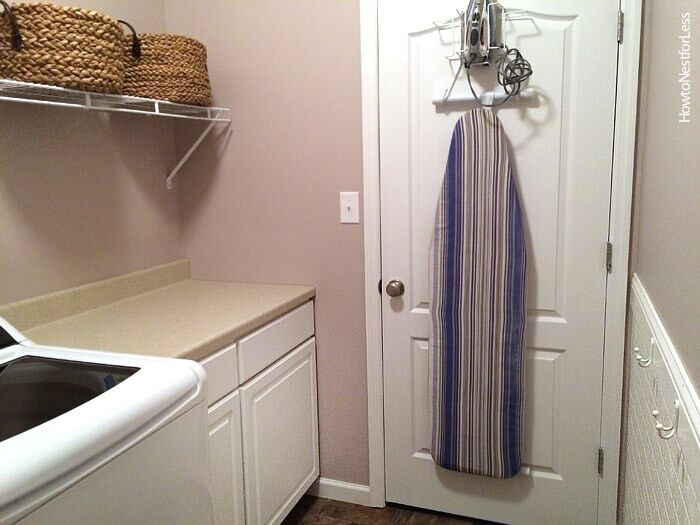 The ironing board and iron hang on the back of the laundry room door. Everything else is stored in the baskets or the cabinets. Love having the countertop as a space to fold clothes fresh out of the dryer. 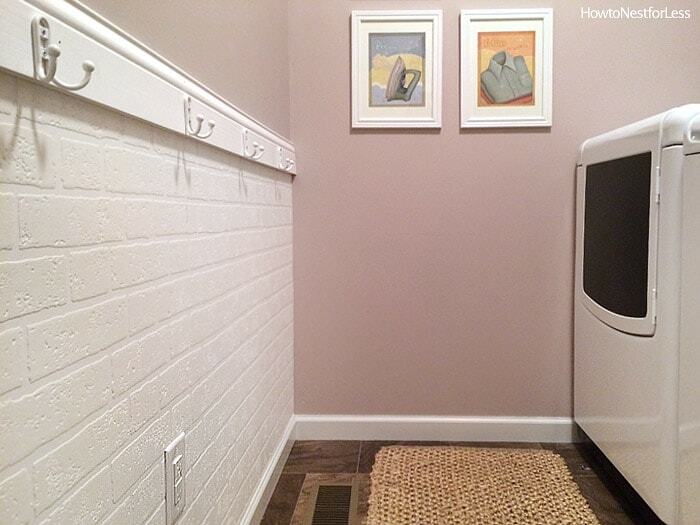 Opposite of the washer & dryer I made a hook wall like our old laundry room. This really got a lot of use so I knew I wanted to implement the idea again. I used a white brick wallpaper from Amazon. I do NOT recommend the product. It was flimsy and tore easily. Yeah, it looks 100% completely fine in the end, but it was a pain to work with. After the wallpaper was hung, I added a large piece of trim as a chair rail and screwed some hooks (check for studs first so the hooks are secure with long screws and can hold heavy things like bookbags and winter coats!). 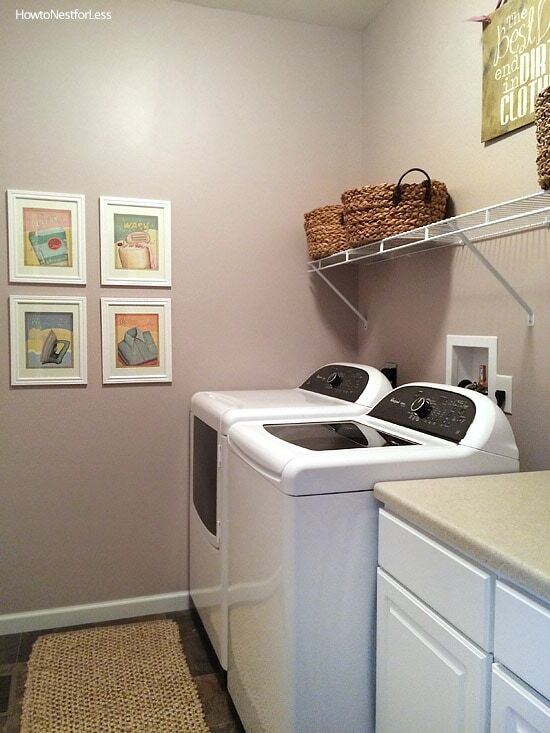 So yep, that’s about it for the laundry room. As I said, super simple design but I love it. 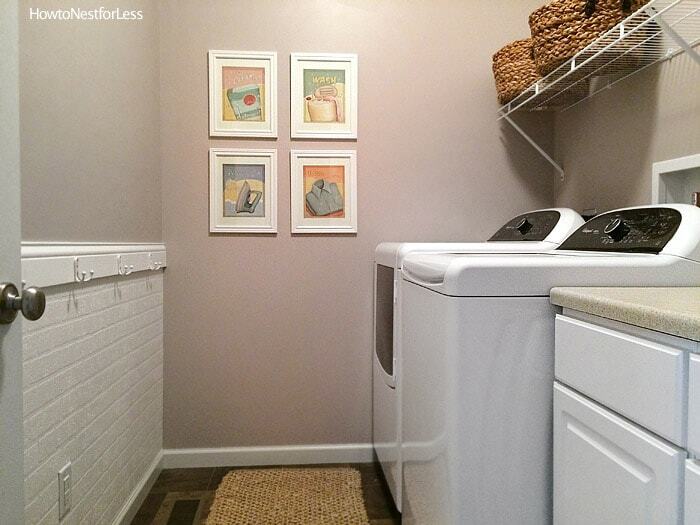 I am totally and completely jealous of your laundry room, especially that faux bricks! 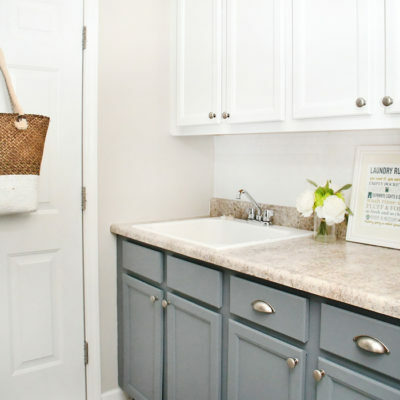 Oh I wish my laundry room could fit some cabinets! I need to figure out something! The room looks great. The wall paper looks so realistic! I will be using your chair rail and hook idea and the pictures as well. Thank you Erin! Thanks Eric! Good luck with yours! Oh, I totally thought those bricks were real 🙂 What did you use the hooks for? Kids’ coats? They seem too short to me for hanging coats. 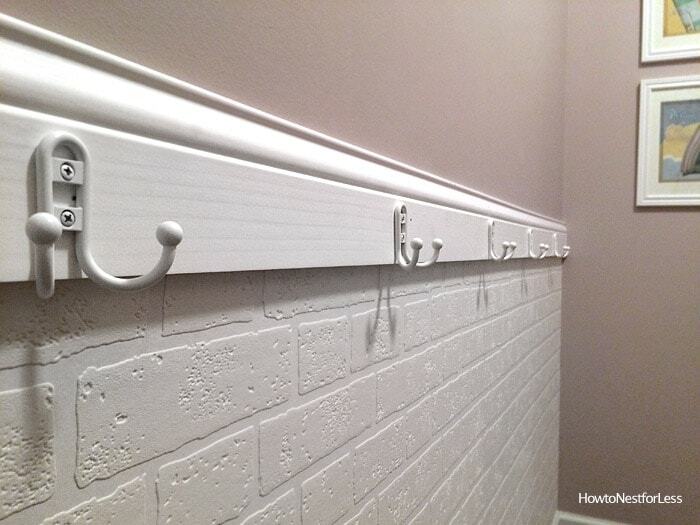 I hadn’t thought about putting hooks in our new laundry room and am not sure what I’d end up using them for. We hang jackets and bookbags on the hooks. Kids coats fit just fine without hitting the floor. You can’t hang long adult coats though. I love this makeover. I love how you also consider what is worth spending money on and what isn’t. I have wire shelves as well and actually prefer the open space for getting my laundry sorted off the floor.